The H12 contract ends 31 Aug (route lost to London Sovereign), and most of the others could probably be replaced soon by spare buses. Not sure about how the Arriva ones leave. There is no VLAs on the 142, as that is with RATP now, those VLAs would be the ones at GR used on SD routes and for the DD working on the H18/H19. I think Metroline's 55reg VWs on the 607 will be the last batch of B7TLs in regular London service. Also I think Stagecoach will end up having the last Tridents on regular London service as well. So East London area could end up having both the last Volvo B7TL's and Dennis Tridents in London. Shame that all these great vehicles are going, never experienced much of the Dennis Trident, but Volvo (DAF also for that matter) vehicles were the main thing in my area, with all the X/Y/51 reg voith VPLs at EW, 52/the one 54 reg DLAs on the 142 (later joined by DLA36/320/321 and even later by DLA180/206), VLEs on the 114, VPs on the 302 etc all were such great vehicles to travel on, and they certainly will be missed. My area is now just down to the 5 remaining VPs (534/536/544/545/549) which all rarely seem to venture off the 460 to go on the 302 these days, the TAs on the 32 (641-643/645/648/657) all of which I haven't been on as I never use the 32, GRs remaining VLAs (2, 8, 15, 103, 116, 122), ALs last Gemini 1 VLW95, and maybe more that I may have missed, although these are the main ones. It's a shame we don't still have the london bus page.com by Matthew Wharmby. Used to be great for the weekly updates/article pages many of which focused on the last days of the Metrobus, Titan, Olympian aswell as articles focusing on the last few months of all such buses. And oficuse provided a page on every night of the Routemaster withdrawal. Think yourself lucky, my area was full of B7TL's & DAF's with some Tridents and now none exist bar VLA56 & 57 running on the 690. My area is full of Enviro 400's of all kinds, Evoseti wanderings on the 35 & 37 and a small number of Geminis between the 2 & 432 - even the last two Darts at TL that were regularly on the P4 have now gone with just Enviro 200's between the P4 & P5 and on batch of Streetlites on the 355 - very boring compared to the variety before. Only DMN1, 7-9, 11-13, 16-18 & former Metrobus 142 are left in terms of Marshalls on regular services. DMN10 & 14 bit the dust in the summer of last year whilst DMN15 was withdrawn last month or the month before. The ex-First DEs can't be used because they diesel. The SEes ordered for the 214 are unlikely to be available until August 2019, as that is when the new contract starts with Go Ahead. Therefore only diesel vehicles will be available for use until then, with euro6 examples likely being preferable. TFL will have to make an exception to this route for the first few months of the ULEZ, UNLESS the electric vehicles can be in service earlier (which may require negotiations to the new and existing contracts). Route 214 could well be the final Dart route in London. 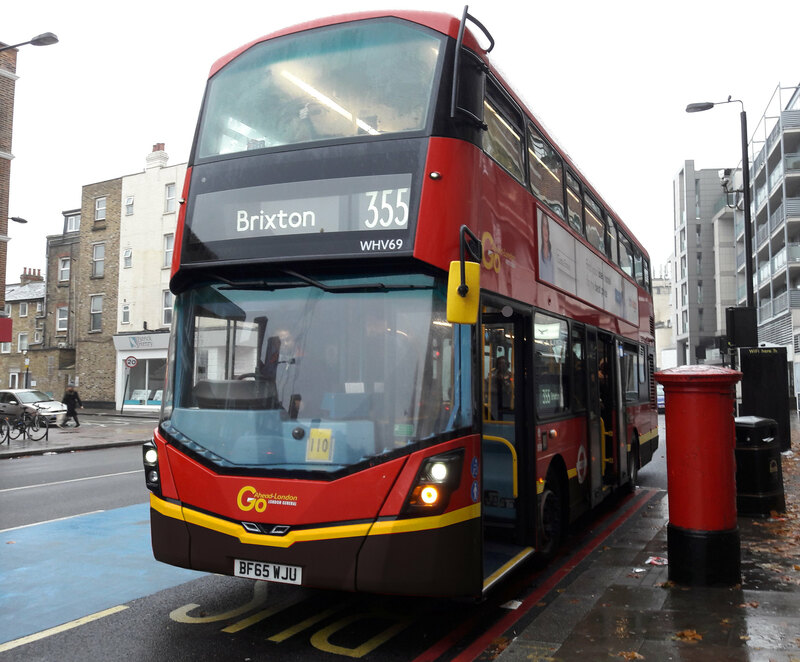 The new E200-MMCs for routes other than route K3 and BYDs for London United may well see off all remaining London United Darts. Abellio route 461 might still have some long-term as might part of route K1, but I am not sure why these do not have sufficient mini-E200s. The 214 will likely use DEs fully once the VMHs enter service on the 274 and BELs on the 46 - until the end of contract. As these can be converted to euro6 for the ULEZ (before the SEes are used at NP), but the DLDs can't. I think the 214 is actually allocated the 11reg DEs now, and the 55reg DLDs allocated to the 274. The refurbished 11reg DEs will probably soon move to G for the 95, but the remaining 11 and 12reg at HT/KC can form the 214's allocation until end of contract, plus some of the 58reg ex-first DEs. I can see how DEs, especially if convertible to Euro VI, will be more suitable for route 214 during Metroline's final months than DLDs. I just reckoned that Metroline's priority was to withdraw ex-First DEs first, such as on route 95 like you mention. I appreciate that ULEZ is destined to bite, causing the withdrawal of DLDs before next August. The 214 & 274 swapped allocations a while back so the 274 is allocated DLD's & the 214 DE's. This is presumably done like the time the 410 & 450 switched allocations so the older buses could be removed first. The 461 has it's own non TfL buses so the K1's MPD's plus the other MPD at TF have nothing to do with the 461 & the reason why the K1 doesn't have enough Enviro 200's is because it has had two PVR increases during it's contract - firstly a +1 increase which saw a V reg MPD added and then a +2 increase which saw two ex Travel London MPD's added with the V reg MPD being replaced by another ex Travel London example at some point. The 95 does not need all of the spare DEs from KC. There are also some surplus 12reg from the 46 that can be used. With the withdrawal of Epsom's OP34 coming in I'm honestly still in shock that QL's Solo SRs will be all gone before the older originals. I understand all the boring logistically justified reasons as to why this has been done/ is being done under full RATP ownership the division, but from someone who takes interest this is continually infuriating me. I've taken a couple of the new 470 buses (although all so far have been on the S1 ) and as much as I like them, I really really miss the old OPLs - can't believe after 5 years I'm having to refer to them as old . For years Epsom was regarded as one of the most unique areas for London transport but RATP have simply come in and decimated this. Heres to hoping that the 406/418/467 are given E400MMCs instead of G3 Streetdecks. Thank you for your info about the service on route K1 being increased. It's a pity that early mini-E200s released earlier this year were not used to replace MPDs here. At this rate route K1 could see the final Darts on TfL service anywhere. As an aside, I think Scania OmniDekkas are another endangered type. It seems the only ones left in London are on route 292 until December. OmniDekkas are so old that even those cascaded within GA Metrobus from London to Crawley are mostly if not entirely withdrawn now.